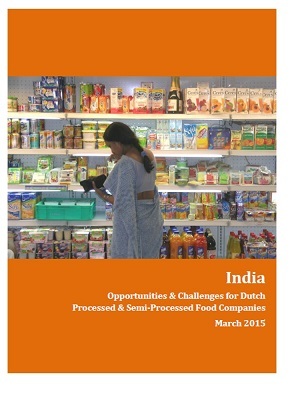 A seminar was organised on the 12th of May in Zeist (the Netherlands) on “the Opportunities & Challenges for Dutch (Semi-) Processed Food Companies in India”. Highlights of a report and other insights were presented by Devangshu Dutta, chief executive of Third Eyesight. Other entrepreneurs who also shared their experiences in India, and the Dutch agricultural counsellor, Wouter Verhey, was present at the event. Welcome and opening remarks by Wouter Verhey, Agricultural Counselor India & Sri Lanka at the Embassy of The Netherlands in New Delhi. The market for processed food in India by Devangshu Dutta of Third Eyesight, India. Entrepreneurial challenges in the food sector in India by Peter Uyttewaal, Partner India of Larive International. The characteristics and strengths of the Dutch Food and Grocery Industry by Sekhar Lahiri of FNLI. Discovering the Pot of Gold in India by Sumit Saran of Future Consumer Enterprise Limited, India.